What the Church will oppose to the attacks against it, how believers should protect their shrines, whether it is necessary to toughen punishment for insulting religious feelings, what migration policy is preferable and what the main threat for Russia is. Patriarch Kirill of Moscow and All Russia answers these and other questions in exclusive interview to Interfax-Religion correspondents Alexey Sosedov and Valentina Trubetskaya. Your Holiness, we will remember the last year for numerous anti-church actions. What conclusions did the Church make in this connection, what did it bring out of this experience? - "What has been will be again, what has been done will be done again; there is nothing new under the sun" - are Ecclesiastes' well-known words (Ecclesiastes 1:9). It is not surprising for the Church to face the actions aimed at violating and insulting shrines and religious feelings. Christianity all through two thousand years of its history lived through various oppressions - from Roman emperors' persecutions of early Christian Church to mass murders of clergy and believers in Soviet years. And what about nowadays campaigns against Christian symbols in public places, which we witness to in European countries? Isn't it a persecution of Christians under slogans of secular state sometimes brought to absurdity? The anti-church campaigns that took place in 2012 are consequences of the strengthening of the Church positions and influence in society. 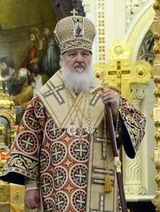 People's confidence in the church and the clergy is high in Russia, which is confirmed by public opinion polls, and that gives to peace to the enemy of mankind and those who follow him. They would like to see our church as silent in the face of sin, lawlessness, and injustice. They would like it to be inconspicuous - not persecuted, not banned, not exiled. Or they would like to see it as just folklore, some exotic embellishment of folk life, which has no real influence on people's minds and hearts. Our entire church community, the clergy, and active laymen have no intention of giving up and stopping our work to promote moral values and evangelical principles in the life of our people. We have no intention of stopping our missionary work, preaching, and public activities. We will continue caring for the poor and the sick, we will continue to openly call sins sins. That's what our Savior called on us to do. He also warned us that people will resist the word of God and the world will rise against the Church. Today we see that more and more people in public and political life are becoming firm in their morals, which are based on evangelical values, adding that these people some from various social groups, have various levels of education and income, and often have various political views: the right, the centrist, the left, with conservative or liberal accents in their attitude to state and society. But all of them are children of the Church. I am happy that our society is becoming more perceptive to the word on Christ. This doesn't mean that we need to calm down and rest on our laurels. On the contrary, this means we should work with more energy, resist injustice, lies, and sin more actively. - What do you think about the initiative to set up Orthodox volunteer teams to protect shrines and a draft law that should toughen responsibility for blasphemy and insulting religious feelings? - A Christian should protect his shrines by all morally justified means, which allow him to remain Christian. To protect shrines doesn't mean only to enhance security in churches. It includes bright publications in mass media, opposing insults against the Church. It is protection of our faith in public discussions in community of sceptics and atheists without insulting their human dignity. But what is the most important is a personal example of righteous life. When we follow the words "so you must love one another, by this everyone will know that you are my disciples"(John 13, 34-35) is the best way to say what is holy for us. Incidents that took place last year in several churches where icons and crosses were desecrated made many believers take measures to protect their shrines. It witnesses to their growing self conciseness, their ability to self organization which are characteristics of civil society and responsibility for their Church. The most important is that opposition to blasphemy should be adequate and without aggression. That's why I urge all church rectors where voluntary teams will be set up to be especially attentive. Several provocations, scandal stories will be enough to make the right idea of protecting shrines a reason for new attacks and mockeries against the Church. The legislation protecting religious holy places and symbols, certainly, needs change and improvement. A fine in an amount of several hundred rubles for blasphemous words written on churches, mosques, or synagogues indicates that society does not quite realize the importance of protecting believers' religious feelings. However, any legislation on the protection of religious symbols and feelings of believers should be thoroughly improved to prevent their use for arbitrary restriction of freedom of speech and creative expression. - Sociologists register growing level of xenophobia in Russian society. To overcome this social problem lessons of tolerance are introduced in schools, human rights advocates constantly speak about it, but hostility to migrants still remain. What recipes would you suggest? - Hostility to people of alien faith, nationality is a sin. As any hostility and lack of love to a person. Statements are not enough to avoid this sin, systematic solution is needed. Our society needs extremely clear, transparent, efficient migration policy that would take into account rights and interest of original population, and not momentary economic needs of the country. People who come to Russia for a long time to work and to live should be ready to study and respect local traditions, including religious ones, and, in particular, to abstain from some models of behavior accepted in their native places. One of the most important conditions of peaceful integration is steady knowledge of the Russian language. In this question the Russian Orthodox Church is ready to provide practical help to the state and public structures. Even today there are joint projects of the Church and the Federal Migration Service aimed at settling the task. It may seem that lessons of tolerance guarantee peace and well-being of polycultural society. I don't think it is true. Such courses have been practiced in Europe for many years, but the effect is dubious. Such lessons can hardly make anyone respect people of alien culture. And if migrants and local population learn to respect God's creation in every person, then no one won't treat each other as inferior.Fundamental religious and cultural education is needed for it and introducing it is a great and laborious work. We don't see any alternative to the approach tested in many-centuries history of pre-revolutionary Russia when respect to representatives of various religions and cultures was rooted in their own religious tradition rather than in courses of tolerance. - Please, name the main threats for Russia. - I think that the main threat for Russia is loss of faith, rejecting faith as people's conscious choice. Not under pressure as in the Soviet times, but voluntary contempt of the Heavenly Kingdom for the sake of vanity and illusionary attractions of the earthly kingdom. Unfortunately, there are signs of this process. For the sake of comfort and joys people refuse following moral norms. Thus, gradually, limits of sin and righteousness are washed away. And what was considered unworthy of a person: alcoholism, drug-addiction, lust, prostitution, homosexuality become norm. Society has always suffered vices, but today as in times of Roman and other civilizations decay they were considered socially approved. In result the institute of traditional family is collapsing. Rooted in sins, man lives in passions and doesn't want to hear a sermon about Christ as acceptance of the Gospels commandments demands him to reconsider his behavior, to change himself, to make a spiritual effort to overcome imperfection. Eventually, there's a real danger of rejecting Christ, rejecting the Orthodox faith. If it happens to us, we can speak about the end of our national history. If there's no faith - there' no Russia. And "faith without works is dead" (Jacob 2:26).We are especially urged to remember it when celebrating the Nativity of Christ and I congratulate you on the feast. The Nativity of the world's Savior is the event that has changed the history of humanity - it is an example of divine indulgence to people, to all of us. Let us, following the Lord Jesus Christ, share joy of the feast with those who need help. Our Christian joy about Newly Born Divine Baby won't be full, if we don't extend the helping hand to those, who need it.